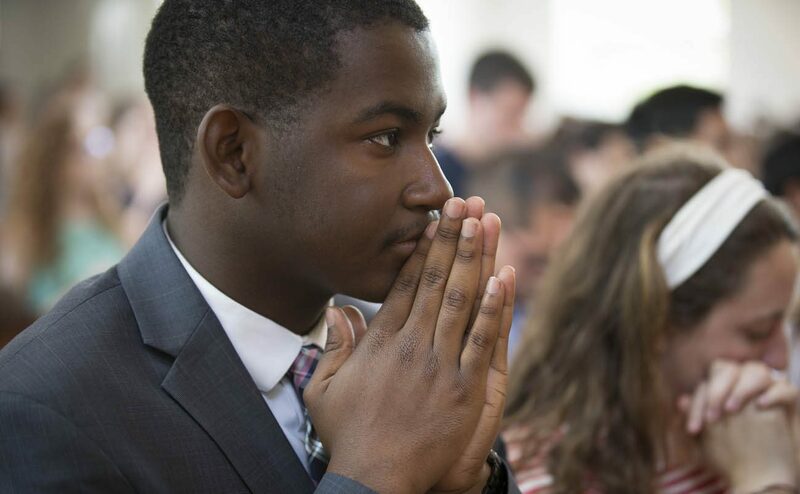 WASHINGTON (CNS) — When Isaiah Burroughs, a 20-year-old student at The Catholic University of America in Washington, gets an idea in his head, he follows through with it pretty much immediately. The next day he talked to a priest on campus about joining the Rite of Christian Initiation of Adults and the next Easter he was confirmed — a day he said he “couldn’t stop smiling.” He’d had a countdown on his phone for a month leading up to it. Burroughs didn’t leave the RCIA program behind after he finished it, but instead came back the next year to help as one of its volunteers. 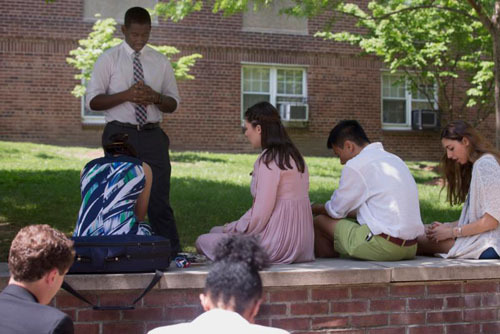 Anthony Carona, a seminarian at Theological College, who helps lead Catholic University’s RCIA program, said Burroughs “encapsulates the evangelical nature of the church” because he was drawn to the church by “evangelical methods” — through friends and campus ministry — and is giving back by now helping others who want to take this step. Carona was not at all surprised to find out Burroughs was selected to be one of the delegates the Archdiocese of Washington is sending to the “Convocation of Catholic Leaders: The Joy of the Gospel in America” July 1-4 in Orlando, Florida. The convocation, sponsored by the U.S. Conference of Catholic Bishops, is an invitation-only event meant to give the 3,000 participants expected to attend a better understanding of what it means to be missionary disciples in today’s world through workshop presentations, keynote addresses and prayer. “It’s such an honor to be invited … I’m really excited about it,” Burroughs told Catholic News Service May 2 in a break between his final exams and during a time he said he was drinking a lot of coffee and making sure he set aside enough time to pray. He also hopes to come away from the gathering with new ideas about how to bring people into the church and to help the university and the archdiocese rebuild the church. That connection is key, he said, noting that people will listen more to someone they are close to and who cares about them. Burroughs, from Fort Washington, Maryland, was just finishing up his sophomore year when he spoke with CNS. Originally working toward a degree in politics, he is now a theology major, but he thinks the two could work hand in hand. His two years in college have already given him a large dose of politics. During his freshman year, he noticed the local seat with Washington’s Advisory Neighborhood Commission had been vacant for five years. Not surprisingly, he decided to run for the spot and after winning he became one of the youngest public officials in the District of Columbia — adding monthly meetings to his already full schedule. The summer before his sophomore year he was selected to be a page at the 2016 Republican National Convention in Cleveland where he helped behind the scenes and got to meet plenty of political leaders. Whatever his next step will be, Burroughs is convinced it needs to be rooted in prayer. Right now, he said, whenever he prays he just wants to grow more in his faith — “to read a saint biography or watch a Bishop Barron video,” referring to YouTube commentaries on faith and culture by Auxiliary Bishop Robert E. Barron of Los Angeles. Contributing to this story was Chaz Muth.